Something I always think as I work on the series is how hard it was to make The Legend of Zelda: Ocarina of Time, but it was also a great time. As mentioned earlier, we were making something unprecedented. There wasn’t anything you could compare it to. As we went through a process of trial and error and watched it take shape each day, it was really fun working on it. Each day we said, “Oh, look at what we did!” and that built up. For example, we were really impressed when the sword was able to cut a sign. (Kazuaki) Morita-san17 at SRD programmed that. You don’t just cut the sign, but float it in the pond. When Miyamoto-san saw that, he burst out laughing and said, “Now that’s The Legend of Zelda!” 17Mr. 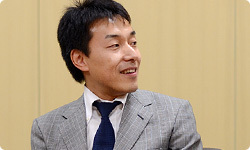 Kazuaki Morita: Board member and Kyoto branch manager, SRD Co., Ltd. As a programmer, he has participated in development of numerous titles, including games in the Legend of Zelda and Super Mario Bros. series. Aside from cutting the signs, The Legend of Zelda: Ocarina of Time was a game with lots of forms of gameplay that players were experiencing for the first time and that must have made them think, “What’s this?” and “What’s going on here?” Kawagoe-san, why do you think you were able to make a game like that? The group believed that anything was possible with the Nintendo 64 system, plunged ahead, discovered a lot of interesting stuff, omnivorously adopted it, and threw it all together in a way without any friction, resulting in a dense concentration of material. But as with the moon sliding into view, which came up earlier, a lot of things fell into place by chance. We’d get a lot done that we hadn’t even imagined. I feel like we encountered a lot of those happy chance occurrences. So the developers could get excited about the daily discoveries. Each day, I experienced the reward of seeing the practically empty world that I had first designed with only squares and triangles rapidly become more real as various people added their input. I was incredibly happy about that. I suppose we could do that because we were all young. Koizumi-san, I think you’re the youngest among the team members here today. How old were you when you made The Legend of Zelda: Ocarina of Time? I was about 26 or 27. 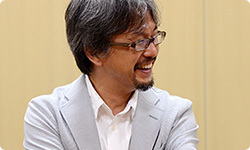 How about you, Aonuma-san? I was in my thirties without doubt. (looking serious) I was the youngest among those of us here, so I was ill at ease (laughs) and couldn’t really say what I wanted. Did I? (laughs) I think it will show up in the next session of “Iwata Asks,” but the designers (Yoshiki) Haruhana-san and (Satoru) Takizawa-san were in their early twenties then, and they kept up their enthusiasm. The development period was two and a half years. And it was a particularly intense two and a half years. When it’s that long, you should run out of breath, but we never did. It wasn’t hard at all for me to work until or past midnight every day. It was fun how each day was different. You raced along for two and a half years, experiencing immense changes each day. Work is generally fun, but that may have been the most satisfying time. I was able to make a lot of selfish demands, so I think we caused everyone trouble...but it was fun. We weren’t selfish - we were dedicated. I think if the same team ever had to make the next The Legend of Zelda: Ocarina of Time, it would probably be fun.